Students and faculty conversing with Andrew McClellan before the program. This post published on the Mid-Atlantic Association of Museums Blog on November 23, 2010. November 18, Seton Hall University welcomed Andrew McClellan, Dean of Academic Affairs for Arts & Sciences and Professor of Art History at Tufts University, for his program Museum Expansion in the Global 21st Century: The Case of Abu Dhabi. This incredible program included information about the unfolding developments in the cultural and tourism sectors in the United Arab Emirates. Recent revenues from the oil and gas industry have spurred economic booms in places like Qatar, Dubai and Abu Dhabi. These areas are utilizing this opportunity to build their cultural sector in order to create sustainable tourism and financial stability for the future. Projected view of the Saadiyat Culture District (photo from Saadiyat Culture District website). Sheikh Zayed National Museum, designed by Lord Norman Foster + Partners, will provide a testament to the life and times of Sheikh Zayed and his inspired vision. This museum with house both permanent and temporary exhibitions based in five categories: Environment, History, Education, Unity and Humanitarianism. A temporary exhibition at the Emirates Palace will open as an extension of the existing exhibition and will explore the concept and vision for the new museum. Maritime Museum, designed by Tadao Ando, will shed light on the U.A.E’s relationship with the sea and their maritime activities. This stunning bit of architecture will actually allow for boats to pass through under the museum. Louvre Abu Dhabi, designed by Jean Nouvel, will be a 24,000 square meter museum which will include 6,000 square meters devoted to permanent collections and 2,000 square meters for temporary exhibitions. This partnership with The Musee du Louvre and Agence France-Museums will seek to present paintings, drawings, sculptures, manuscripts, archaeological findings, and decorative arts collected from all over the world. Performing Arts Centre, designed by Zaha Hadid, will host cutting-edge theatre, music and dance from around the world. The Centre will also house an Academy of Fine Arts. Aerial Shot of the Culture District (photo from Saadiyat Cultural District website). McClellan raised a number of interesting points/issues/thoughts about this large cultural complex and the potential impact it may have on the future of museums. Many museums are merging with their cities’ identity. As the Louvre is synonymous with Paris, so will these museums be with Abu Dhabi. Can and/or will other museums start to strive for this recognition in their own cities? The museums are located directly on a large body of salt water which will be in actually be in contact with some of the institutions. What effect will this have on the architecture and what conservation issues will it raise? Who will visit Saadiyat? With such a large cultural complex going up at once how expensive will visiting be, and will it be a location people wish to go more than once? Will they be able to persuade 150,000 people to move to the island where condos and housing are being built? New York University will have a campus of Arts and Science on the island. Will they be able to attract enough students, or will the program fail as did the program Michigan State attempted to start in Dubai? Is there a plan for the museums to stand on their own? Most of the museums are currently partnering with other institutions for both curatorial assistance as well as collection loans. Will the museums have compiled enough collections to stand on their own when the current agreements run out? Visit the Saadiyat Island Cultural District website for more information and photographs. 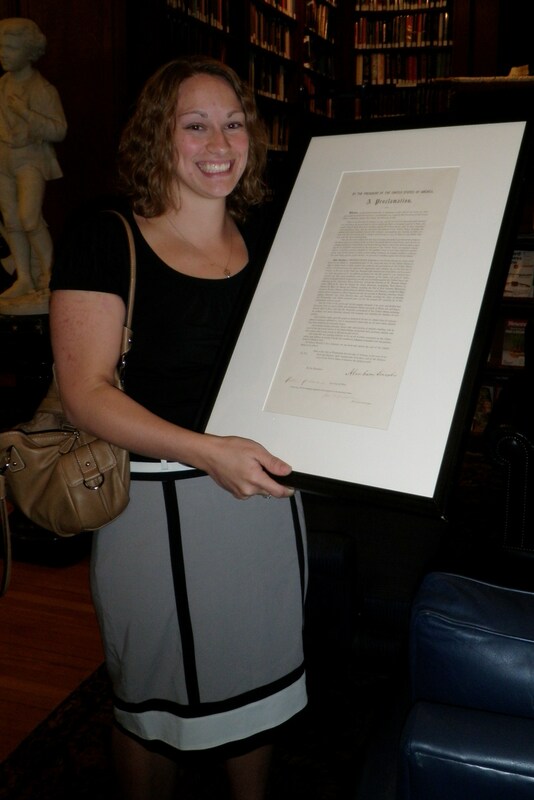 Pam Schwartz holding an original signed (by Abraham Lincoln) Emancipation Proclamation during the MAAM Conference Opening Reception. This post originally published on the Mid-Atlantic Association of Museums Blog on October 31, 2010. When I applied for the Mid-Atlantic Association of Museums Bruce Craig Fellowship, I had just begun planning my move from Iowa to New Jersey to attend graduate school at Seton Hall University. I knew that it could be a good networking occasion, a chance to meet a few other professionals in the area, and familiarize myself with some of the museums. I never guessed that the four days of the conference would be one of the most enriching experiences of my career thus far. The opportunities made available to working professionals and students alike were many and worthwhile. I attended seminars over a broad spectrum of topics from online museum models to sustaining historic homes. I made acquaintances with colleagues from all over the world and came face to face with the spooks during our tour at the Eastern State Penitentiary. Throughout the conference I was continually impressed by the amount of passion I saw in individuals for all things museum. Though we as museum professionals often converse about the dismal outlook of our field, I believe that, with so many passionate advocates, museums will sustain as appreciated and irreplaceable centers of edification for generations to come. My favorite aspect of the conference was the Leadership Luncheon on Monday. Great conversation developed between mixed tables of seasoned and emerging professionals who all came ready to the table with questions and tips for one another. From this experience I gained valuable knowledge about the expectations of employers in my field as well as getting pointers for my cover letter and resume. Thank you to all members of MAAM and the supporters of the Bruce Craig Fellowships. Your contributions help several emerging professionals each year to offset the costs of attending the conference and in giving them the opportunity to grow both as a professional and as a person. My experience at the 2010 Conference has been an amazing opportunity and I am already looking forward to attending next year. Morris Museum Exhibition. Photo from Morris Museum website. 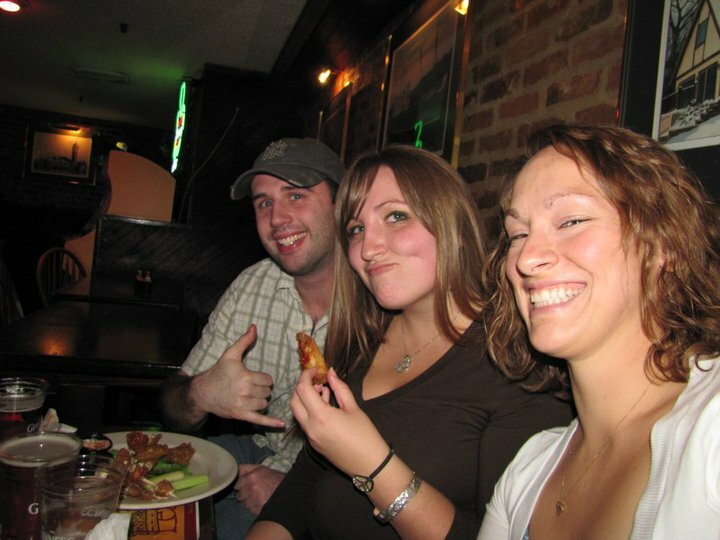 This post originally published on the Mid-Atlantic Association of Museums Blog on November 1, 2010. This session provided an excellent crash course in creating cohesive and appropriate exhibition design. The principles discussed could be used in any type or scale of exhibition. With presenters from LHSA+DP, Morris Museum and New York Hall of Science this session also provided attendees with an extensive set of hand-outs covering the basics of design and a large list of resources. The first exhibition design discussed was that of the Mechanical Musical Instruments and Automata from the Murtogh D. Guinness Collection at the Morris Museum in Morristown, NJ. Designers utilized historic patterns, advertisements, photographs and typographies to convey the time period they were exhibiting. Instead of creating a full reproduction Victorian period room in one area of the exhibition, they pulled elements from this era and morphed them into a sleeker and more modern version. Including wall space, furnishings and even flooring style gives a room a definite feeling of time without becoming a focus of the exhibition itself. Rocket Park Mini Gold Course. Photo from New York Hall of Science website. The second example was the Rocket Park Mini-Golf course at the New York Hall of Science. Each hole of this course is based on actual rocket science and the look and feel of the exhibition was inspired by space-age graphics of the 1960’s. The course was intended to teach visitors the physics principles demonstrated during a complete space mission from blast-off to splash-down. The design team created collages of typography, colors and graphics to gain a feel for how the elements would work together. Create an immersive environment in which to contextualize objects, convey a time period do not replicate it unless that is what the exhibition calls for. Design should support and enhance the presentation and interpretation of the collection. Build a clear and concise hierarchy for multiple levels of information. Create distinct personalities for each exhibit area. (i.e. Victorian style carpet or curtains in a room meant to look like Victorian theatre or in an area meant to represent historic Paris, create a cobblestone-like walkway). Make sure there is a large contrast in color scheme choices especially between type and background. Include a visual hierarchy, make it obvious what visitors should look at first, second and third. Make all elements proportional while maintaining consistency. Make sure the visual elements are constantly reinforcing the content of the exhibition. Prototyping visuals and layout is never a bad idea. This can save a lot of money and effort later if things don’t work out. Attendees proved to be willing participants in this session-turned-workshop on creating reflective discussion about change in museums. Participants walked into a room of several circles of chairs with white paper and pictures on the walls. Sitting at random, we were given a page of material on a certain topic as far-reaching as New Age knitting circles. What are the stories people need to hear and how do we know? We were then directed to brainstorm what QUESTIONS, not answers, arose in our mind after reading the material and being asked the first question. If museums are changing, does that mean they are better adapted for the changing culture? If not, why and what can we do about it? During each round of this activity the presenters Linda Norris, Managing Partner, Riverhill and Ken Yellis, Principal, First Light Consulting, were impressed with participants’ eagerness to discuss the issues. Who has the authority to decide upon or enforce change? Do museums sometimes change just for changing’s sake? Is that a good thing? Is the role of museums to resist or embrace change? Are museums able to engage diverse audiences without necessarily catering to each? At what point do you critique change? What changes are only necessary from a financial, visitor, or internal staffing viewpoint? Risk: how far do you go? Participants in this exercise enjoyed being able to have open discussion with many people from different museums, instead of only hearing about a topic from two presenters. It offered a wide perspective and generated incredible conversation over many topics that are prevalent in museums today. This post originally published on the Mid-Atlantic Association of Museums Blog on October 27, 2010. Wyck is NOT a historical house museum. This was the monumental point of today’s session presented by Eileen Rojas, The Wyck Association; Laura Keim, Curator, The Wyck Association; Donna Ann Harris, Principal, Heritage Consulting Inc.; and Page Talbott, Principal, Remer and Talbott. Though technically Wyck IS a historic house, the staff have undertaken an initiative to utilize creative, participatory, and dynamic but still historically accurate interpretation. Instead of creating simple period rooms the museum is hoping to portray 300 years of history in just four spaces. Wyck wants to move on from being a simple place to visit to becoming a place of vital discovery of the past. They felt it was beneficial to visit other historic houses in order to familiarize themselves with what was out there; this also helped the individuals working on the project together to form a better relationship amongst themselves. The presenters stressed the benefits of working closely with their Board. This includes many of the people who are most expressly passionate about the museum and want to see it succeed in its mission. The museum is striving to keep ‘Wyckish’ traditions and core values but at the same time fit them into a new interpretive byway. Realizing the full interpretive plan might be a long time coming but museums should set short and mid-term goals for implementation, making it a gradual process. This post originally published on the Mid-Atlantic Association of Museums Blog on October 26, 2010. Cheap is great, free is better! Co-Founders of the online museum, The Museum of the Macabre, Richard Fink and Robert Fink have developed a cost-free internet model that will allow museums to maintain a web presence at the excellent low price of free! Though creating websites and online collections do take time there are many free sites and applications an institution can utilize in order to cut costs. The following are the main tools the Museum has used to create their website. To see a practical application of all these tools visit The Museum of the Macabre online. Their website is built entirely using these FREE applications. These tools have the ability to help many museums create an online presence in an easy and effective way.